Which areas do the Local Joint Committees cover? There are 20 Local Joint Committee’s in Shropshire. Great Ness and Little Ness Parish Council is part of the Loton, Longden, Ford and Rea Valley Local Joint Committee, which also includes the following Parishes. Longden, Ford, Hanwood, Minsterley and Pontesbury. Where and when do the LJC meetings take place? Meeting take place three times a year in venues across the area. Full details of future meetings, and also minutes of previous meetings can be found on the Shropshire Council website. What do the Local Joint Committees do? Local Joint Committees are able to scrutinise local service delivery and to call Shropshire Council's leading members or senior managers to attend meetings and explain decisions affecting their locality. They are also able to hold other public service providers, such as the NHS, to account and to refer matters of concern about service delivery to the council's scrutiny panels. 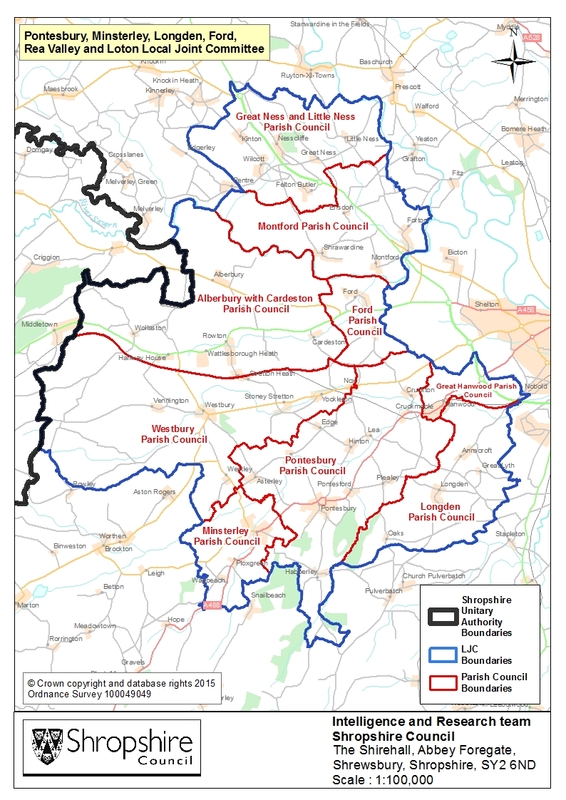 The committees act as the formal consultation mechanism for Shropshire Council, over and above that provided by local parish and town councils. Councillors David Roberts, Roger Evans and Tudor Bebb from Shropshire Council and all of the parish councils in the local area have voting rights when it comes to making decisions. Local people are able to discuss local issues, raise concerns, ask questions about local services and call service providers to account. Other public organisations such as the police, primary care trust, fire and rescue service, can also be invited to the meetings to provide information. Each committee is supported by a community enablement officer from Shropshire Council. The community enablement officers help to maximise local engagement in the work of the Local Joint Committee, support members of the committee to bring forward matters of interest or concern, and help to ensure that strong links are made with community based groups, organisations and activities.